A deep trough is located over Greenland and Iceland while upper ridge is strengthening over the W-CNTRL Europe. An upper low is centered over Algeria. At surface, an intense cyclone moves east between Greenland and Iceland while a shallow cyclone is located over the S Mediterranean. ENH / SLGT risks have been issued for parts of N Atlantic into NW Iceland with threat for severe to extremely severe winds in excess of 120 km/h. 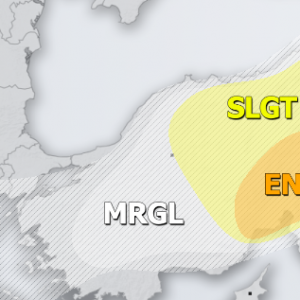 SLGT risk has been issued for parts of coastal N Norway (Lofoten) with threat for severe winds, locally reaching 90-110 km/h. 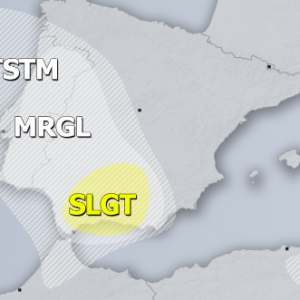 SLGT risk has been issued for E Tunisia into S Mediterranean for severe storms, capable of producing marginal hail, severe winds and torrential rainfall. 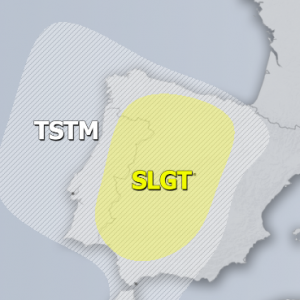 Favorable shear parallel to the frontal boundary should lead into excessive rainfall (80-100 mm per 24 hours) across Lampedusa island towards ENE Tunisia.